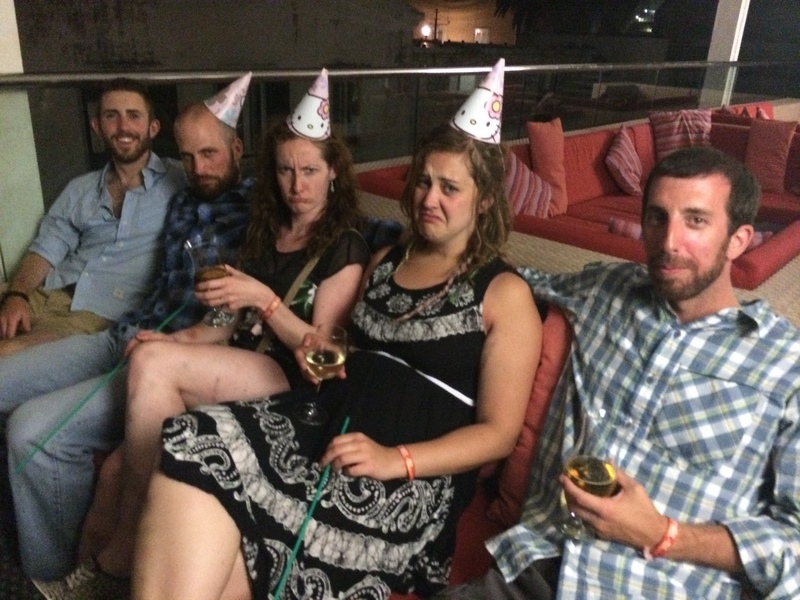 I’ve been struggling to find words to encompass my experience with The Yacht Week. It’s not real life. It’s nothing like real life. 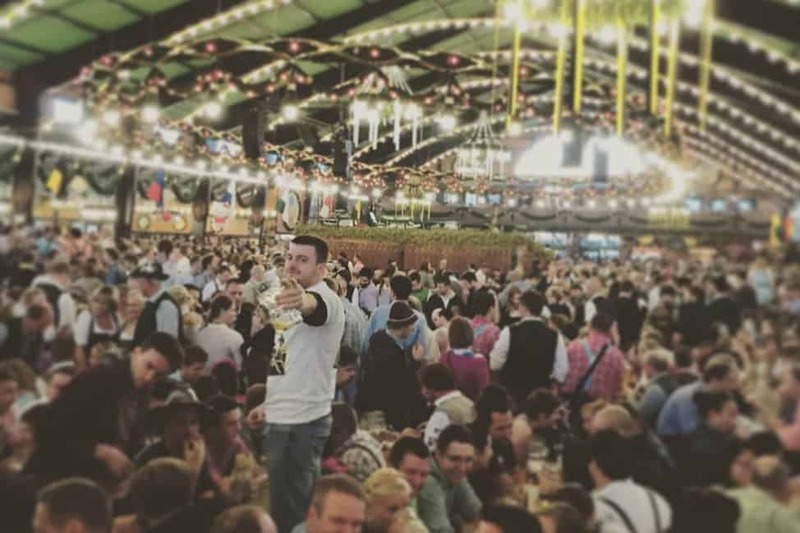 It’s a fantasyland of rainbows and abdominal muscles and beers and inflatable devices. It was the best week of my life. Me havin’ a time.Hopefully I’ll have some GoPro footage to show you later. For one week I put aside all insecurities, all troubles, all deadlines, and escaped from reality. Nothing could interrupt such bliss. Every day kept getting better and better, and somehow we kept on truckin’. We’d wake up feeling like garbage but within an hour of sailing we’d be right back on top of things. 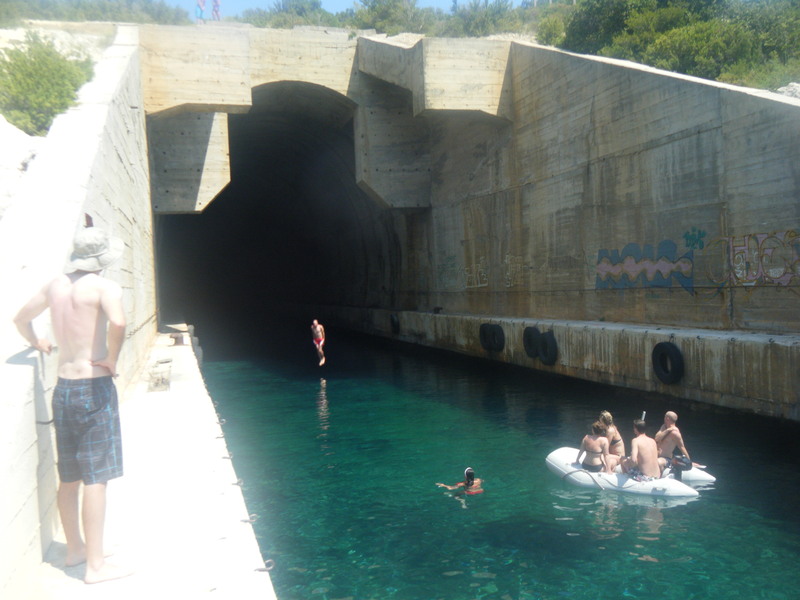 Swimming in the Adriatic, cold beers on deck, inflatable dinghies prepped and ready to go. I find it hard to believe it all happened. 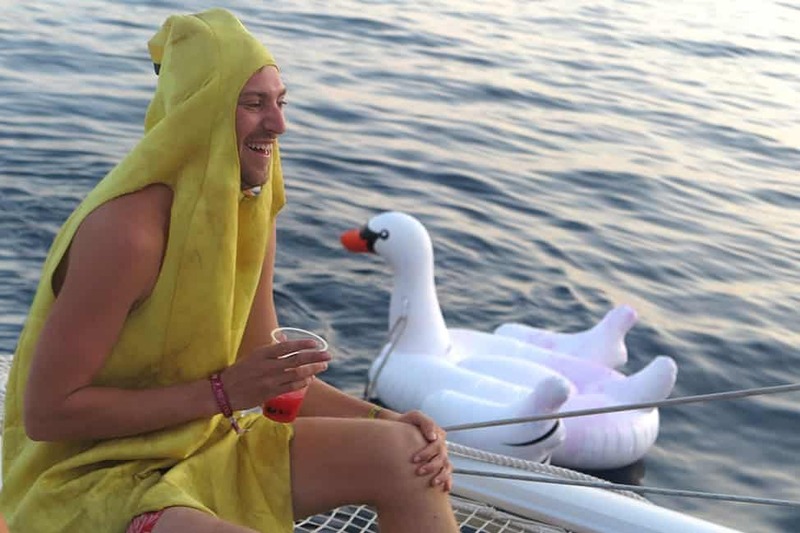 Water guns and inner tubes and guys dressed as bananas riding dragons. Everything was just…perfect. Our majestic skip at sunset.BUT it was a first-time experience for my entire crew…skipper included. There are a lot of things I’d do differently. I’m here to tell you about them. Our biggest mistake of all time was picking the cheapest boat we could get our hands on. It was a small racing yacht for six people, including our skipper. It was a fine yacht, but everyday the cabin area looked like a hurricane blew through, and sleeping arrangements occurred on a first-come-first-serve basis. Our toilet was small and smelly. 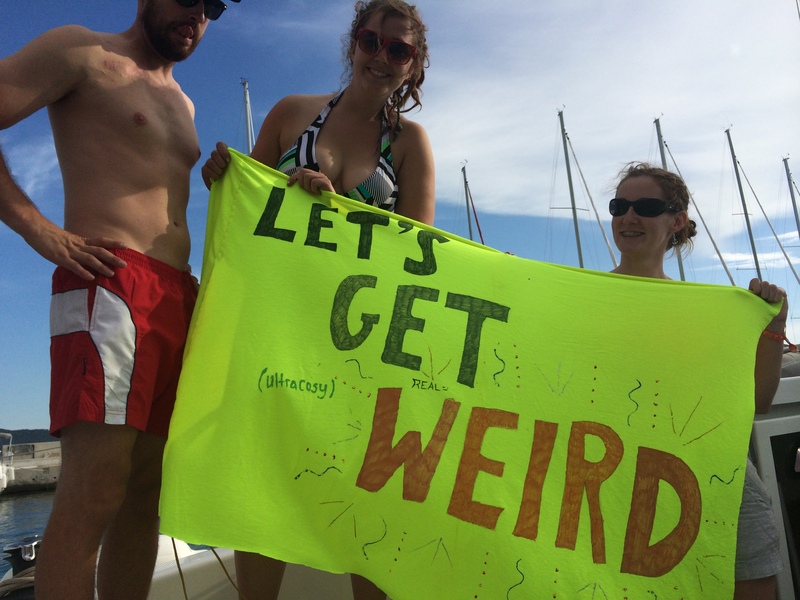 Meanwhile, we made a friend named Mete who happened to be skippering for a catamaran. I was given the grand tour one evening. Their upper room was bigger than our freaking yacht, and they had two bathrooms and a handful of bedrooms. I’ve never dreamt of such luxury. Never again will we take the cheapest option; I can assure you of this. 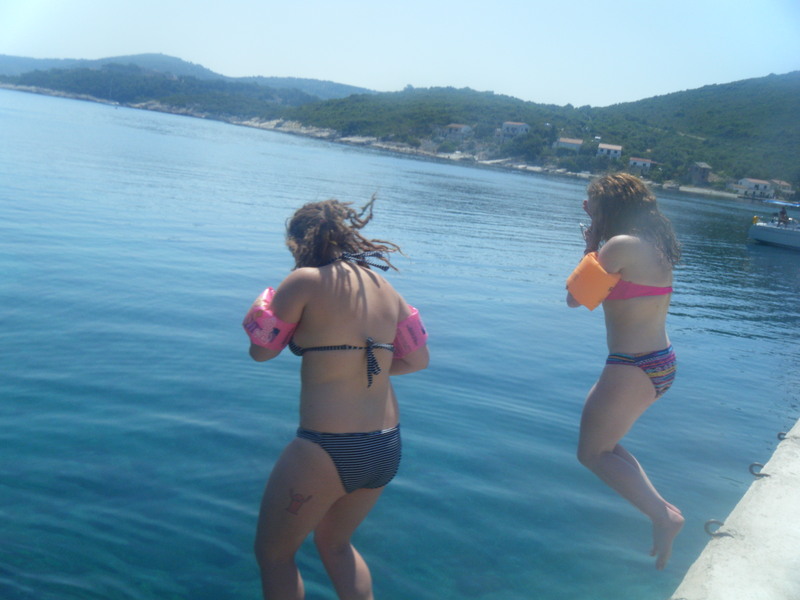 And jumping at the submarine bunker. I don’t know why we let Nick think tuna was a good idea for food. When it’s 30 degrees outside and you’re hungover, the last thing you want is tuna. For the love of all things sacred, plan a grocery list in advance. On our last day we had plain pasta with chopped carrots because we literally had no other food left. We might not have even eaten if it wasn’t for the fact we had to feed our poor skip. I’m sure he’s had better meals. Even better, hire a hostess. We’re doing it next year. They cook AND clean, because few things are more hellish than being stuck below deck cooking dinner in the sweltering heat while a party rages above you. They’re not even a terribly expensive extra cost. 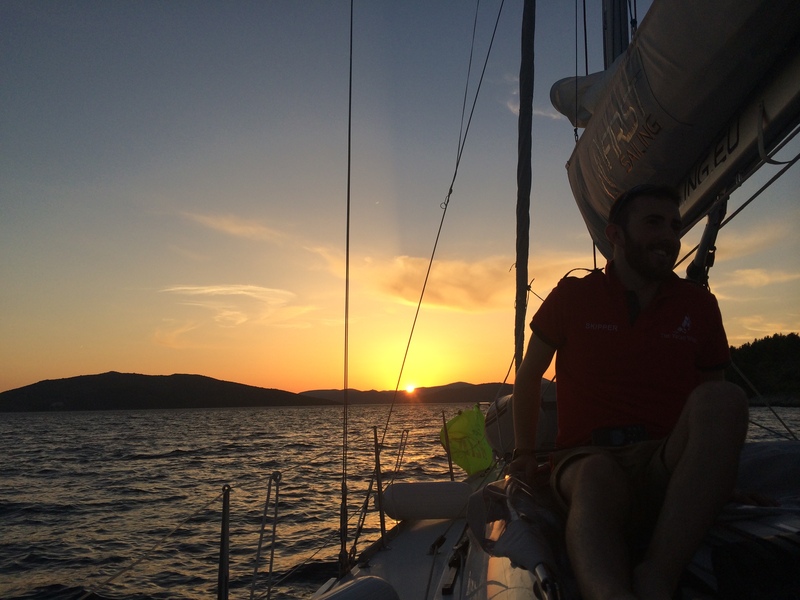 Our wonderfully responsible and perfect skipper, Josh, had advised us beforehand to arrange a sort of “money pot” – everyone tosses in an equal amount to buy booze and food, and when resources get depleted, we simply fill it back up with an equal amount. Except we didn’t do this. We paid for our group purchases at random and were too careless to record things properly. I ended up paying for docking fees, someone else paid for groceries, etc. 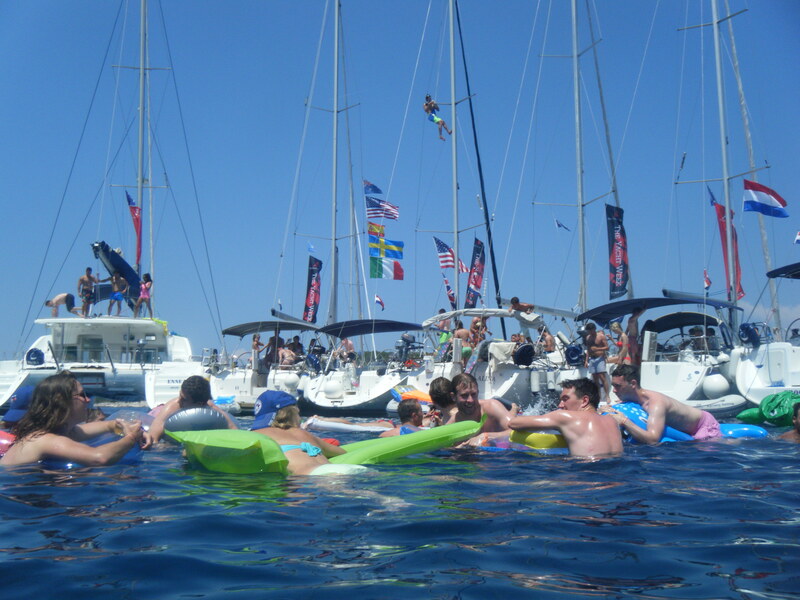 We figured we’d worry about it later, but believe me when I say that on the final day of The Yacht Week when you’re scrambling to get everything off your yacht the last thing you want to do is sit down and sort out every last item you purchased. It was a nightmare and I’m sure at least one of us got stiffed. 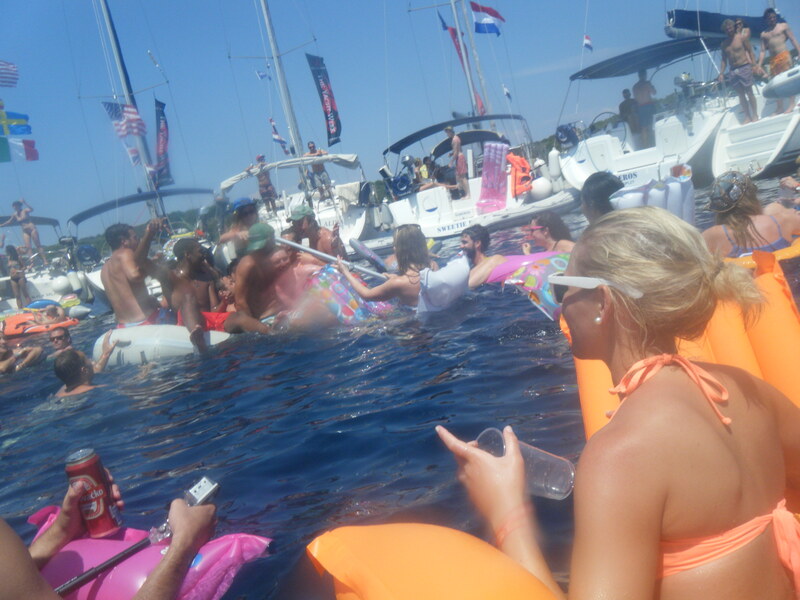 Getting blackout drunk during The Yacht Week is about as smart as not keeping track of your expenses properly. 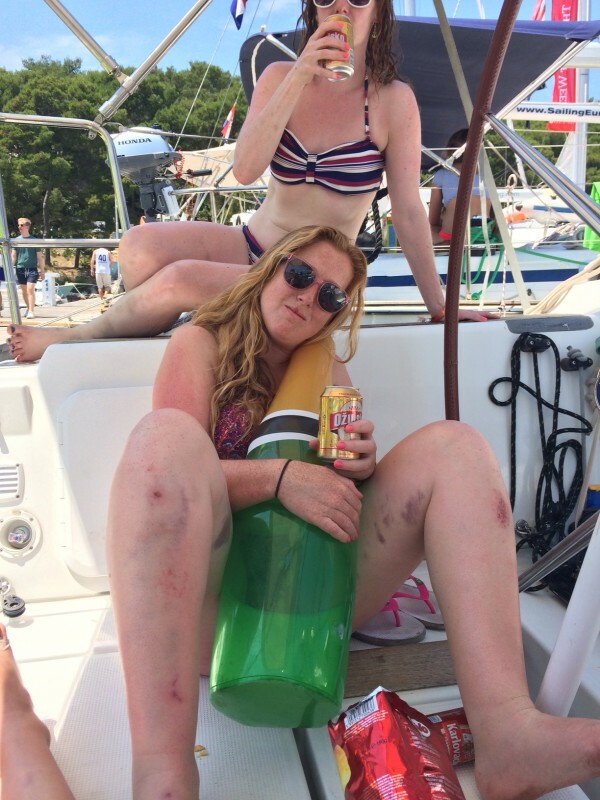 Do you know how easy it is to injure yourself hopping from yacht to yacht when you’re sober, never mind drunk? I literally fell off a boat that was moored next to the sidewalk. I smashed my face into the pavement so hard that my tooth drove through my lip and bled EVERYWHERE. My knees looked like hamburger meat. I’m glad that’s all that happened. I later saw a guy with a sprained foot using one of his crutches as a chin-up bar. Yes, I’m a disaster.On another night, my buddy Nick FELL THROUGH the skylight of a yacht. He wasn’t even drunk – some idiot had placed an inflatable over the hole and he stepped through it. He landed on a table, and thankfully that’s all. Mind your footing. We made a circle raft one day and threw a big party. It was obscene and delightful. Speaking of footing, invest in some Sperry shoes (or similar). 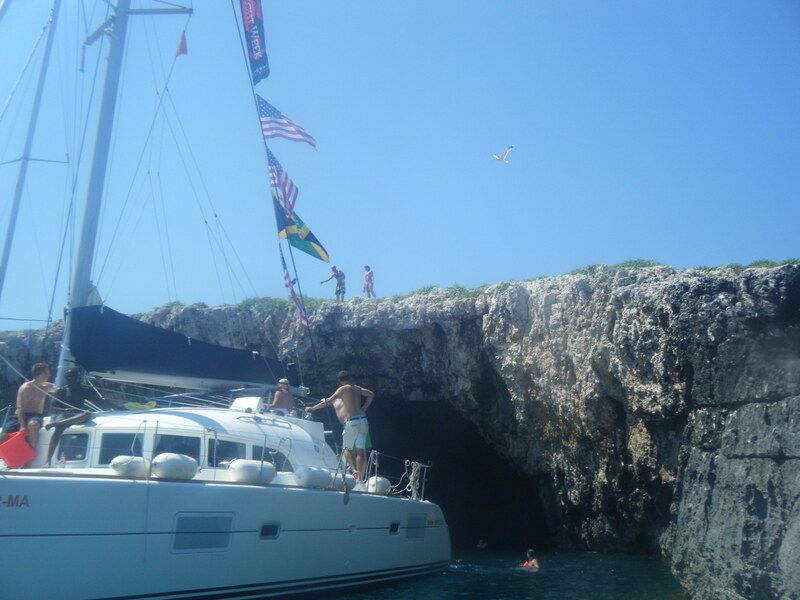 Your feet can get pretty nasty if you’re hopping from yacht to yacht barefoot. Same goes for your inner thighs if you’re clinging to the lines to keep from falling in. Bruises and cuts galore. And really, I mean don’t get blackout drunk. You’re kinda screwed if you pass out somewhere on a boat, because how the hell are we supposed to get you home? We had a pretty weird boat. 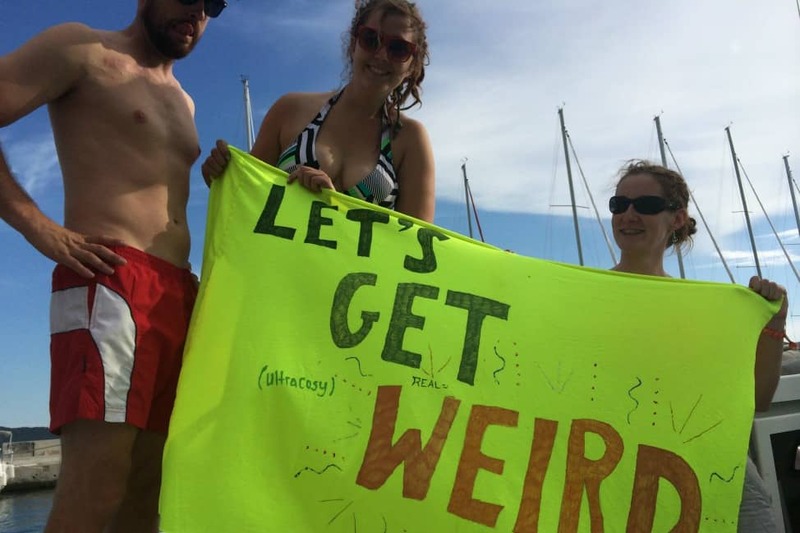 I mean, our sign literally said, “let’s get weird.” One day Nick shaved half his beard. We had an awesome array of inflatables that everyone loved, and we had t-shirts. But now I wish we had put a little bit of extra work into everything: more costumes, more glow sticks, more weirdness. This is literally your moment to do whatever the hell you want. Let your freak flags fly. We celebrated Melissa’s birthday with Hello Kitty hats.We also didn’t have any Canadian or American flags, and I’m not really sure why. 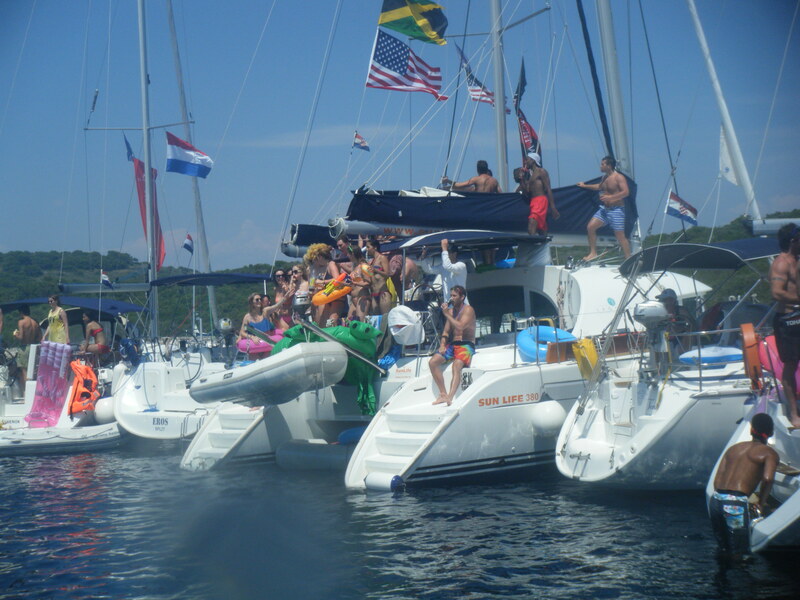 People are hella patriotic, although most of our fleet seemed to be Canadian or American. And really good looking. 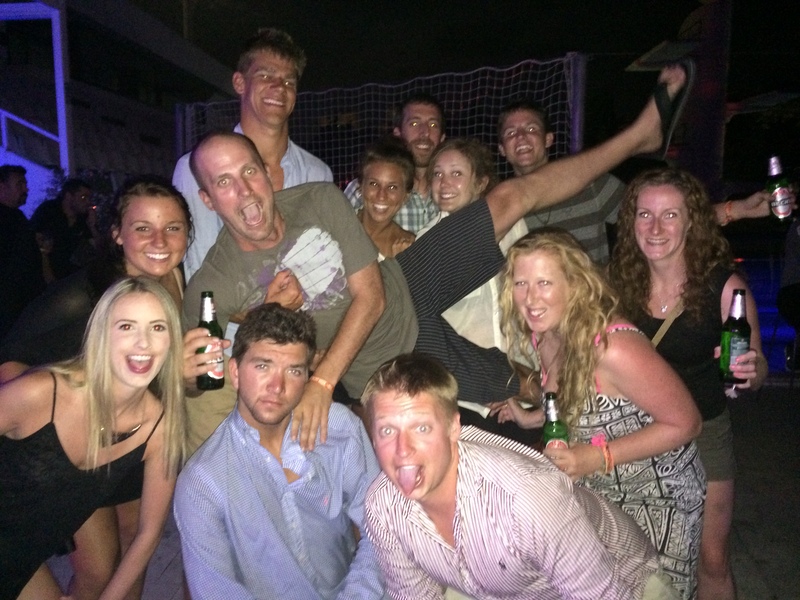 I love this group of people.Will I do The Yacht Week again? Oh, you betcha. Already started saving. SHOTS! Sound like you had a blast! I didn’t really get seasick! 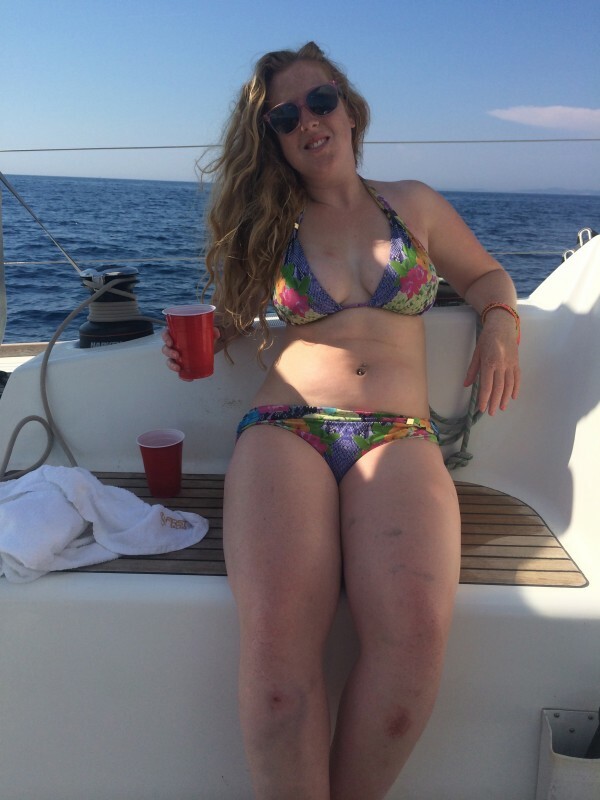 I was more land sick…every time I got off the boat, I felt like I was swaying. It was a gross feeling. Oh my god. This. Looks. AMAZING!! I feel like if all you came out of it with disaster-wise was some nasty bruises and a cut lip, given the photos. you did damn well. Hahaha, I’m just glad I didn’t have a broken leg! This looks like the best vacation ever. I never thought of doing a Yacht Week, but now I think it’s something I seriously need in my life. DOOO IT! If you’re the type of person who can keep going for a week straight, do it. It’s not for everyone…this I know. But my god. What a ride. That looks like a lot of fun haha. Cool piece! Love this post!! Miss you silly sailors!! Yes, most definitely! 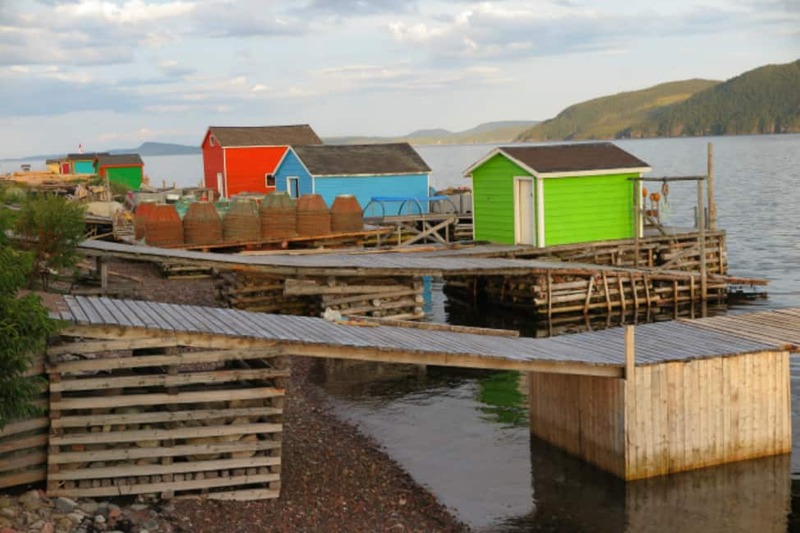 I was told by many skips that beginning of summer is best time to go, when all the skips are still fresh-faced and the port towns don’t hate everyone so much. Hahaha. Thank you for this post. I am officially terrified…. I’m not a big partier, and now feeling like I should back out. Haha oh no, I don’t wanna discourage anyone! It’s definitely a party trip but there’s so much more to it than all that. It’s total, pure freedom. Real vacation. 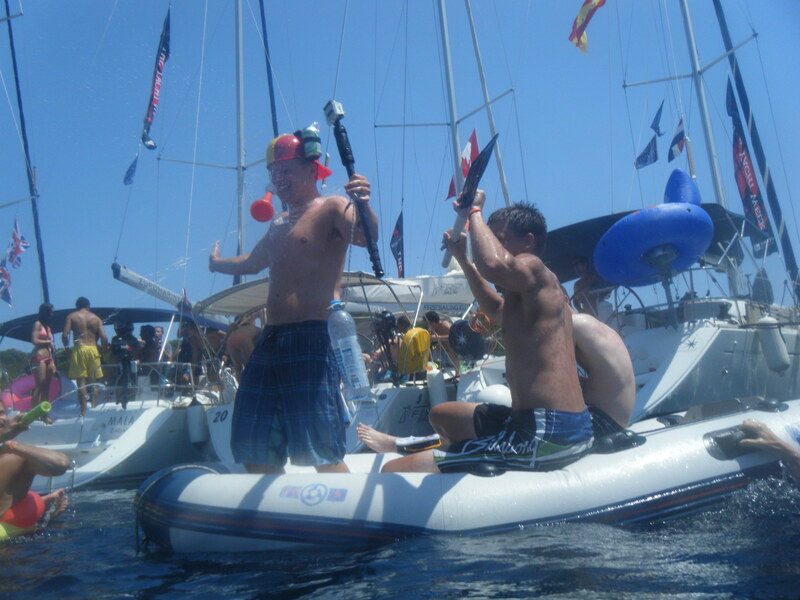 If you’d prefer to hang out on the boat instead of hitting the big events, I’m sure no one would hold it against you. Thank you for this post. I was wondering how much spending money is needed for a week? I would budget at least $500! Maybe a little less if you have a hostess. I’d budget MORE than you think you’ll need, to be honest. I wish I had. Are life jackets needed for novice/non swimmers? Nobody polices such things but I think there are life jackets on board! Thanks for the advice. 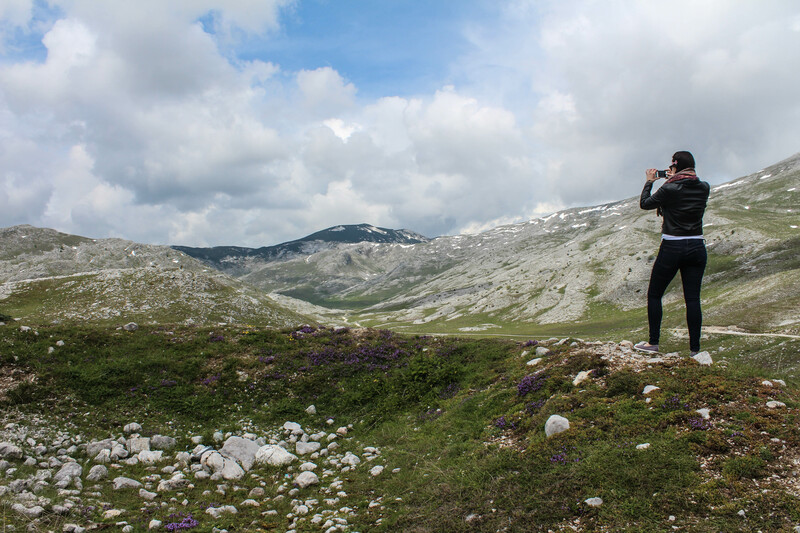 Heading over to Split in 2 weeks to do this and taking notes. 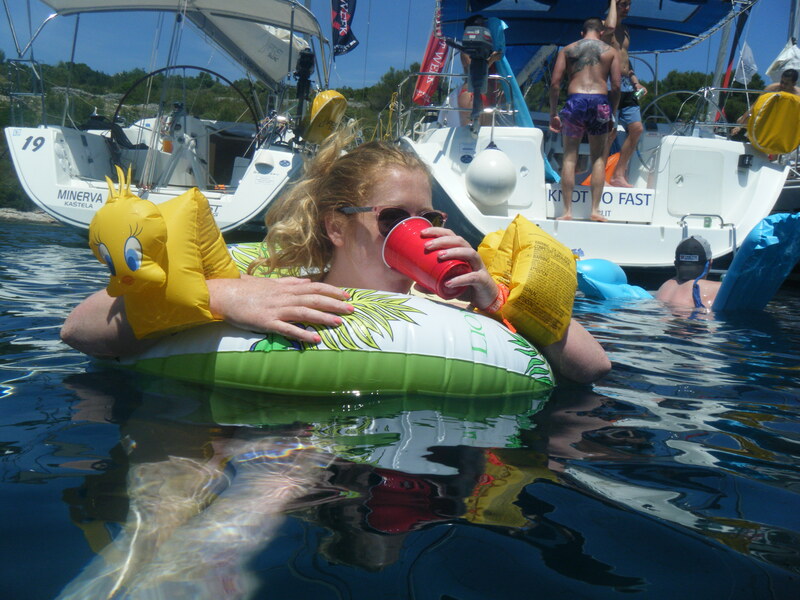 I’m looking to do a sail in Croatia with TYW and im just wondering because I am young single and love party but I also want to swim and see the sights or the islans/ beaches do you get to do that much? or is it mostly just party party party? It’s really kinda up to you! You can easily get out and explore the islands when you’re docked, but I didn’t do much of that. My hangovers are killer, haha. Hey, great tips. If I can ask, how much did you spend beside the week package ? And i mean food, parties, etc. I spent between $500-$1000 total other than the week package! I think closer to $500 though. 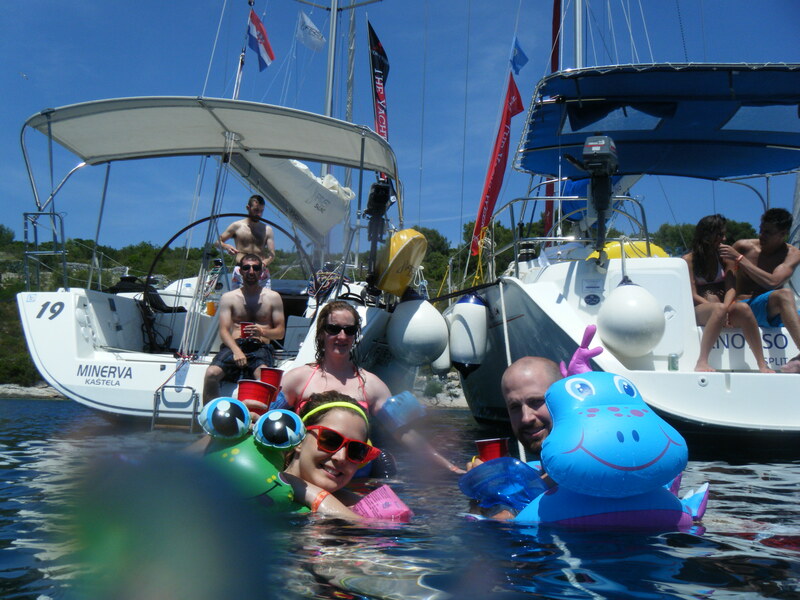 Food and drink in Croatia is cheap (at least when you’re drinking and eating on the yacht). This looks like so much fun! Would you recommend it for someone going by themselves? I was planning a trip for my 30th birthday but I’ll be in Greece by myself. Yes! If you feel like you can be a good judge of character. I did my second year in 2015 and hopped onboard with a bunch of strangers. 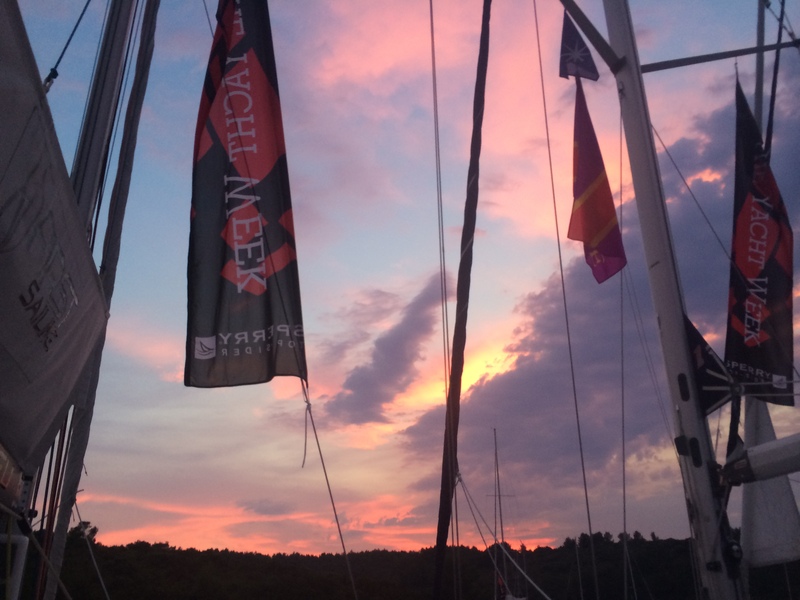 Just use the Yacht Week Crew Finder app and you’ll see all sorts of people looking for crew members! I really lucked out with mine. They were amazing. My bf and I are considering going with 4 single-friends. But we as a couple get the impression that this is more of a trip for singles. We are super keen to meet new people and make friends though. What do you think? Also, Our group will probably be split as we have a 8-person boat and we are a 5/1 boy girl ratio. Does that mean we might have a chance of not sharing certain experiences? You may not be able to book a yacht with that ratio, but I’m unsure how it works now! You may be split up for some things, but not all. My last YW experience had a bunch of couples, and it was totally cool. :) Just know what to expect! Haha. I loved your post specially your tips. 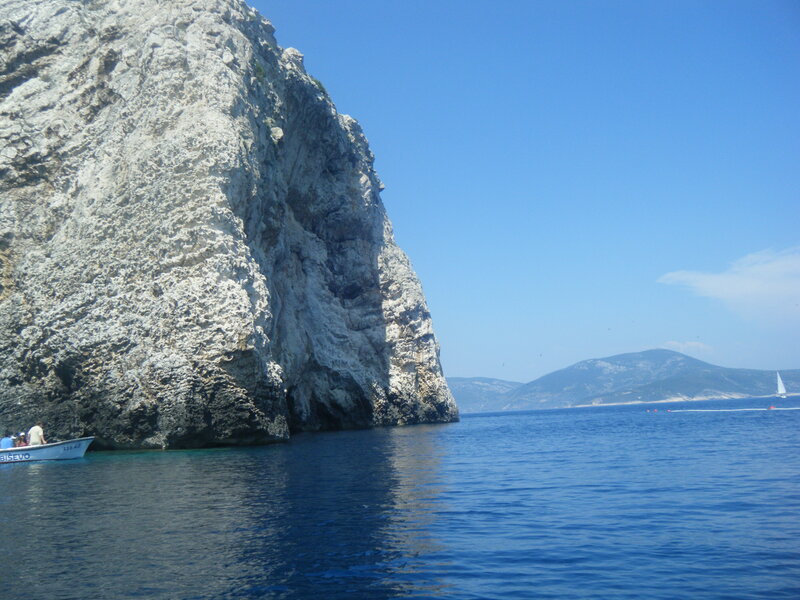 My bf and more 6 friends are planing to go to TYW Croatia in July second week. I just can’t find any post that gives me any idea how much are the extra costs such as fees for the marine, fuel, water etc. Could you tell us what to expect? and which company/website did you book your yacht? do you recommend? It’s my first YW so I am very exited ! Hi Selma, you end up paying all those extra expenses through TYW! Including booking the yacht. The marina fees are low, and TYW usually collect them at each port. I can’t really give a sense of expenses for fuel and water, etc., as that depends on the size of your boat as well as who you’re travelling with. We just split everything among the crew!